Once the chef for Queen Victoria (from 1840 to 1842), the Reform Club, the Prince of Wales and others, Charles Elme Francatelli (1805-1876) became the manager of the St. James's hotel when it opened in 1863. 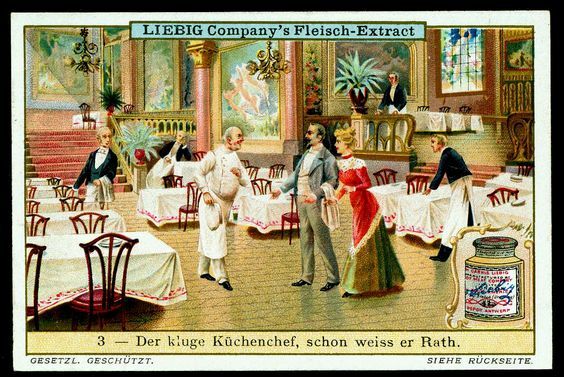 Among his many banquets was one to introduce Liebig's extract as a substitute for beef stock. Another season of the PBS/BBC show "Victoria", so another posting on Victoria's chef Francatelli. Past posts (bio, bombes, recipes) HERE As a celebrity chief he was in demand to prepare large dinners for groups, and to do this promotional event for Liebig. Click images to enlarge. LIEBIG'S EXTRACT OF MEAT COMPANY. "ON Saturday, the directors of this Company entertained a party of scientific and literary gentlemen at dinner, at the St. James's Hotel, in order to set before them experimental proof of the excellence of the extract as a substitute for ordinary stock in soups and gravies. Mr. Francatelli fully sustained his high reputation, and the dinner was superb. The peculiar flavour of the extract (to like or to dislike which is purely a matter of taste) was quite discernible in many of the dishes, and especially in the soups; but, for all who do not dislike this, the success of the demonstration may be said to have been complete. Still, in ordinary households there is no Mr. Francatelli; and such a dinner leaves the fitness of the extract for domestic cookery to be tested in the domestic kitchen. Upon its nutritive value, moreover, we have at present only insufficient data. The chemical doctrines about food have recently undergone changes; and are hardly sufficiently settled to entitle chemists to dogmatise. We find it difficult to believe all that is said of the extract; but we have found the extemporised beef-tea that it affords to be very pleasant and sustaining drink during long hours nocturnal literary labour; and for this purpose, at least, we can cordially recommend it to students and workers. We are not aware, however, that the extract prepared by the Company possesses any advantages over that of other manufacturers; and we have been accustomed to purchase and use more than one variety. It will be found that there are slight differences of flavour between the produce of different establishments; and these differences may be sufficient to determine the choice of some consumers. We have no idea that there are any corresponding differences in intrinsic value; and the essential conditions of success must be observed by all the firms that are engaged in the business." "For some years past efforts have been made to utilise for exportation to Europe as human food the carcasses of the innumerable cattle slaughtered in South America chiefly for their hides. The best rations of them have been sent to this country in the form of “jerked beef,” but this did not find much favour with the British public. Among other scientific men who have devoted a large portion of their time to this subject Baron Liebig [1803-1873] claims pre-eminence. He has discovered a process by which the essence of meat can be extracted, free from both fat and gelatine, and preserved for any length of time. The extract is already extensively used in this country, especially as a ready material for making beef-tea. But in order to demonstrate its great utility as a substitute for the ordinary “stock-pot,” the Liebig Extract of Meat Company gave, at the St. James's Hotel, Piccadilly, on Saturday last, a dinner (prepared under the direction of Mr. Francatelli), the soups and made dishes of which had their bases in the extract. Dr. Richardson, F.R.S., presided, supported by a number of scientific gentlemen who were unanimous in their opinion of the great culinary value of the preparation. It should be stated that one ounce of the extract was used in lieu of two pounds of gravy beef." 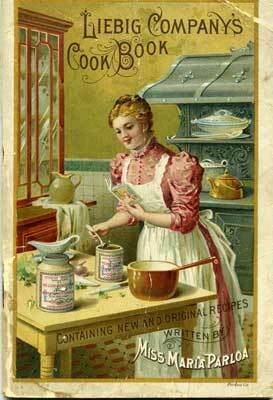 In 1893 the German company put out two different booklets, one compiled by British author Mrs. H.M. Young (Hannah M. Young (1858-1949) more HERE ) and the other by American cookbook author Maria Parloa (1843-1909) - Liebig Company's Cook Book. "28. 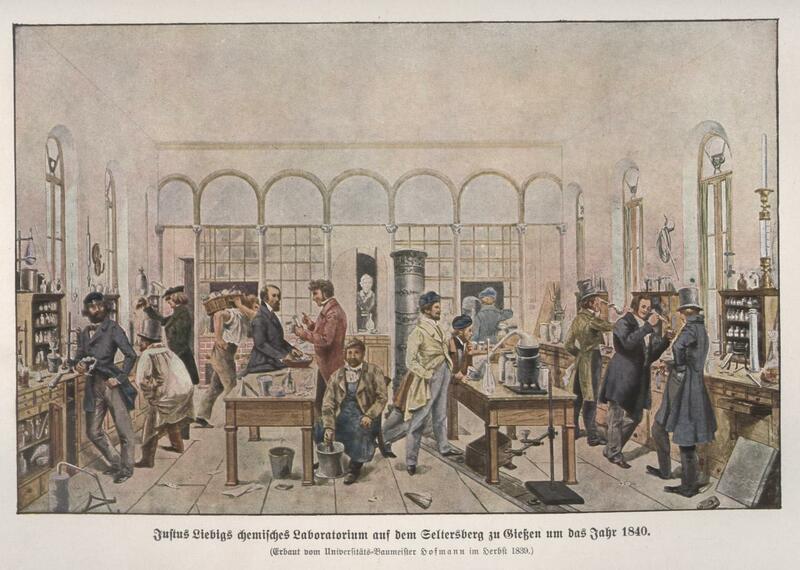 Term of art—Use of name.—In 1847 Baron von Liebig discovered and published a process for making an extract of meat. The extract was made extensively at the Royal Pharmacy, Munich, and sold there, with the permission of the baron, as Liebig's extract of meat, from 1861 to 1864. It became generally known in Germany and other countries, and the term Liebig's extract of meat became used as a term of art in scientific treatises. In 1864 Baron Liebig gave the Fray Bentos Company the right of using his name in connection with the extract of meat manufactured by them. In 1864 the plaintiff company bought the business and property of the Fray Bentos Company, and by a deed-poll, dated the 12th April, 1866, the baron granted to the plaintiff company the exclusive right and privilege to use his name in connection with the extract manufactured by them. The defendants, who had previously sold extract manufactured by the Fray Bentos Company, in I860 began to sell as "Liebig's extract of meat" an extract manufactured by a Mr. Tooth, in Australia, after Liebig's process. On a suit being instituted by the plaintiff company to restrain the defendants from so using the name Liebig's extract of meat, the Court held, that the term having been used as a term of art to designate a well-known process long before 1861, the defendants were fully justified in using it, and the bill was dismissed with costs. Liebig's Extract of Meat Company (Limited) v. Hanbury, v.c.vf. 17 L. T. N. S. 298." 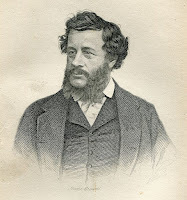 Image of Francatelli from his 1861 book.